Lava advances west on Leilani Avenue on May 27. 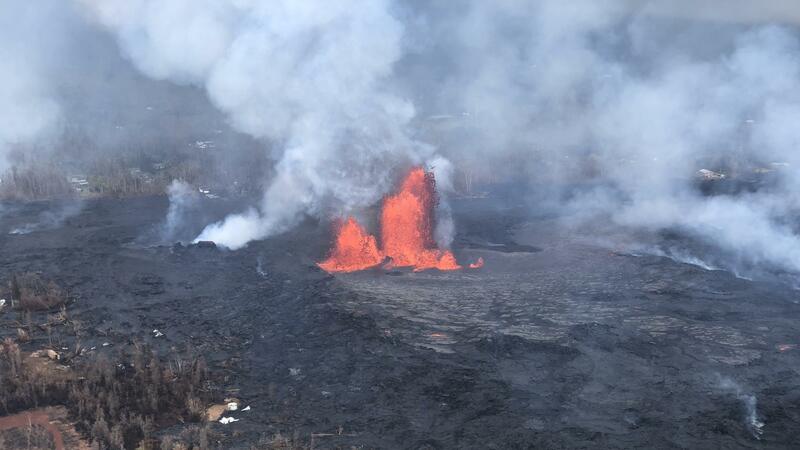 On May 28, lava fountains were reaching heights of 200 feet. But the eruption also presents an incredible opportunity for those who want to better understand the earth systems at work. Scientists are calling this a generational event — the rare time people get to glimpse at the world and processes beneath our feet. Data gathered from this eruption will be studied for decades. Careers will be made. And what we learn from it will inform geology and land-use planning around the globe — information that will hopefully "keep people's lives from being impacted, like they have been during this eruption," says Wendy Stovall, a volcanologist with the United States Geological Survey. Stovall is part of a massive data-gathering machine that has been assembled on Hawaii's Big Island. Drones hover over fissures, blinking like Christmas lights at night, recording and monitoring the lava spread. Sensors around the volcano's summit record each temblor and eruption, while satellites and radar planes watch the drifting ash plumes and shifting earth from space. On the ground is a team of eager volcanologists taking air samples and tracking the lava's progress. It's hard, hazardous work. The gear is uncomfortable and the hours are long, but the opportunity is rare. "This is a once-in-a-lifetime process to really be a part of," says Alexa Van Eaton, a physical volcanologist who has been part of the teams going out in the field. The shifts are awe-inspiring and heartbreaking. On one night, Van Eaton listened to the "clinkering" of a lava flow, "which really does sound like breaking glass" she says. On another night, Brett Walker, a Ph.D. student from the University of Hawaii, Manoa, collected lava samples near a friend's house while the place burned to the ground. "It's just this complete mix of excitedness, happiness and sadness and devastation," she says. Her hope, along with other volcanologists here, is that they can learn from what's happening now to better prepare for other volcanic events, wherever they may be. "Every volcano is different," says Kyle Anderson, a geophysicist with USGS. "But the physics are the same, so to the extent that we can better understand the driving processes and the mechanisms, I think we can transfer that globally." Anderson has been in Hawaii for weeks, watching the ongoing eruptions, the lava flows and the earthquakes. "I'm probably surprised five times a day, 10 times a day," he says. "I'm probably shocked at least once a day." Kilauea was already one of the most studied volcanoes in the world. It has been erupting for 30-some years. But the eruptions were steady, and geophysicists like Anderson started to feel as though they had learned much of what they could learn from them. "This enormous [change] to the system gives us an unbelievable opportunity to get to understand things I don't think we would have realized otherwise," he says. Stovall, who got her Ph.D. studying Kilauea, compares it to the eruption of Mount St. Helens in Washington in 1980. That eruption not only shaped the field of volcanology for years to come but also inspired many young geologists and students to enter the field. Many of those people are now retiring. "We have much younger people coming in," Stovall says. "And with younger people comes an influx of new thoughts, new ideas and new technologies. Also, lots of women. Lots of women." That youth, some of the geologists say, is being seen in the field. Volcanologists are using smartphones to take photos and sound recordings and to communicate with other professionals in real time. Data visualizers and geophysical modelers are able to present the data in increasingly comprehendible ways, helping illustrate some of the ways Earth's systems are connected. The eruption is also giving those younger volcanologists a chance to define themselves and learn in a rare hands-on environment. And it's attracting attention from volcanologists around the world. Natalia Deligne, a volcanic hazard and risk modeler for GNS Sciences in New Zealand, has been watching videos and television coverage of the volcano during her lunch breaks since the eruption started. "Here in New Zealand, we've been interested because our largest city, Auckland, is built on a volcanic field," she says. "So the hazards and impacts we're observing on Kilauea — we can imagine that happening here." Scientists in Iceland, Costa Rica, Japan and other places are also watching with a close eye. For many volcanoes, it's not a matter of if they'll erupt, but when. "The Earth does what the Earth does and we live on it," says David Green, director of NASA's Disasters Program, part of the Earth Sciences Division. "We choose to live near volcanoes, we continue to populate these areas and visit them and tourist on them, so therefore we need to learn how to do that smartly and safely, and that's exactly what we're learning how to do." The images from the volcanic eruption on Hawaii's Big Island are both breathtaking and terrifying. Lava is gushing from cracks in the earth, blasting at times more than 200 feet in the air. For those living in the southeast corner of the Big Island, the eruption is devastating. It's also presenting an unusual opportunity for scientists. NPR's Nathan Rott reports. NATHAN ROTT, BYLINE: Every day, night and minute since this major eruption started, scientists have been tracking its progress. Drones buzz over the rivers of lava, blinking red and green at night against the creamsicled glow on the rising smoke. Sensors and monitors record every earthquake and eruption, and teams of volcanologists are out on foot 24 hours a day, recording gas levels, lava speeds, fountain heights and whatever other data they can get. Unfortunately they don't let bumbling reporters join them in the field, but they will take a recorder. ALEXA VAN EATON: We're here at the margin of the 'a'a flow advancing from fissures 7 and 21 towards the northwest. ROTT: This is Dr. Alexa Van Eaton, a physical volcanologist who's usually stationed in Oregon at Cascades Volcano Observatory. She's standing less than a foot away from a lava flow, recording its speed and behavior. But what strikes her is the sound. VAN EATON: You can hear, first of all, the coqui frogs in the background. You can hear the clinkering of the lava, which really does sound like breaking glass. ROTT: That sound clinkering is actually a technical term. It's the barely audible sound and process of lava breaking. VAN EATON: As a volcanologist, you learn about this term clinker. And for me, it hadn't really sunk in that that's what it actually sounds like. It's clinkering. It's onomatopoeia. ROTT: This is Van Eaton later outside a crash pad of sorts where she and other volcanologists from all around the country are staying here on the Big Island. She is very, very excited about this opportunity, as are the others. As one scientist put it, eruptions like this are a window into the inner workings of our planet. VAN EATON: This is a once-in-a-lifetime process to really be a part of. ROTT: But the reality of what this volcano is doing to people, their homes and property is not lost on any of the scientists here. Brett Walker is a Ph.D. student from the University of Hawaii at Manoa. The other night, she was out collecting lava samples. BRETT WALKER: So as excited as I was to collect this fresh molten piece of lava, I was collecting it on the property of my friend's house, whose house was burning down. So it's just this complete mix of excitedness, happiness and sadness and devastation really. ROTT: Wendy Stovall, a volcanologist with the U.S. Geological Survey, says all of the data they're collecting here will drive research for years. It's a generational event that will define the field like Mount St. Helens did in the '80s, helping scientists better understand how volcanoes work all over the world. 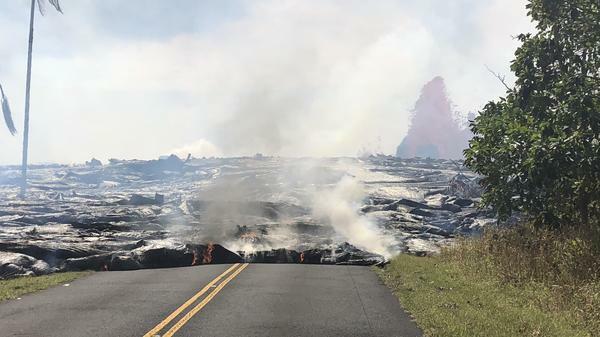 WENDY STOVALL: And that will hopefully inform land use planning, emergency preparedness and keep people's lives from being impacted so heavily like they have during this eruption. ROTT: That's the reason Natalia Deligne has been watching the eruption on TV during her lunch breaks. She's a volcanic hazard and risk modeler in New Zealand. We talked over Skype. NATALIA DELIGNE: Our largest city, Auckland, is built on top of a volcanic field. And so the hazards and the impacts we're observing in Kilauea - we can imagine it happening here. ROTT: And she's not alone. Scientists across the globe are watching Kilauea - in Costa Rica, Japan, Iceland and others - hoping to learn and prepare for the next eruption. Nathan Rott, NPR News, Hilo, Hawaii. Transcript provided by NPR, Copyright NPR.